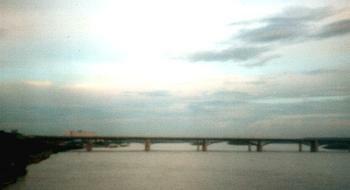 IRKUTSK - MOSCOW , JUNE 2002 - 'So where did you say you go on Holiday ? Siberia...? 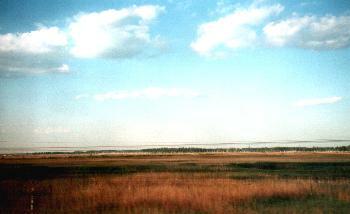 ', a remark often heard when I was talking about my travel plans.... 'And for how long are going to sit on the train ? For 4 days and 3 nights on a train... ? Isn't that boring... ?' Having done the trip now: no it's not boring at all, it's an adventure. 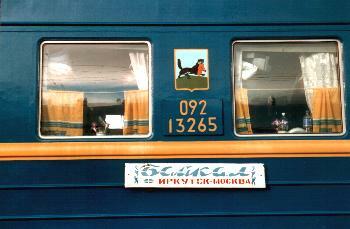 Traveling with the TransSib is like two travels for the price of one. You can look outside and see the landscapes, towns, rivers,... and observe what is going in the world outside. 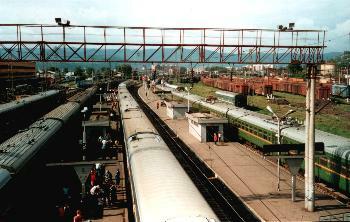 The 'Baikal' train to Moscow was to leave in Irkutsk station in the afternoon. We are in carriage number 11. 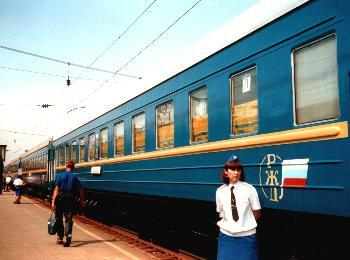 The provonitsa (female carriage attendant) checks the tickets. All aboard... we are leaving soon ! We are in compartments of 4 beds each; the other people in my compartment are Siberian, so a good opportunity to learn some more Russian words - the phrasebook is handy, and I had the luck on the previous train (coming from Mongolia) to be in the same compartment with a Russian teacher, who mastered English well too... so this should work. Well it works..., but after a while I felt sorry for these people, because they really needed to be very patient with me... but then again, we had four days to go, and nobody was in a hurry really. You also meet Siberian people (and other tourists, but not that many) that you can talk to in English and that can do some translation from English to Russian for you. To some of the Siberian people I have been talking to at several occasions during these four days, it was their first contact with non-Russian people on the train ! Most of the Siberian people are on holiday or visiting family or friends, or even going to work. I had some pictures and magazines from home with me, and that was very enjoyable to them. Another point about meeting Siberian people, you are never hungry or thirsty ! These people are really hospitable and friendly & have a great sense of humor ! But now lets look out of the window. The big adventure to me is what I call the 'surprise factor'. Not only you travel through many different landscapes, you also never know when you wake up in the morning and peek out of your window what little towns, rivers, bridges, train stations, factories,... will be coming up today. And you never know what will happen next, like the activity on the platform for instance, ranging from traders spreading out their goods, to babushkas selling potatoes, pancakes or fruits. 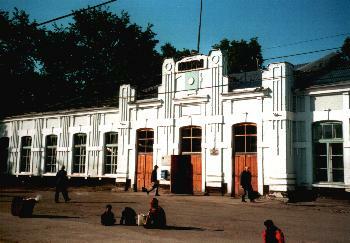 I recall one morning in particular, when we arrived in the station of Ishim. We want to get out of the train to enjoy the fresh air - since this is a 20 minutes stop, and after 20 or 30 hours on the train, you can use all a 'refill' of fresh air. As soon as the train stops, we see these muslim women and children on the platform, asking for food or anything we can spare... Refugies from Kazachstan or even Tajikistan maybe. We get off to buy some breakfast from the stalls, some people give some leftover bread or vegetables,... it's a sad moment, but also a moment you realize how different this world is from what you are used to. The looks in these people eyes will stay with me for some time. on the train, and at every stop, if you look carefully and try to figure out what is going on, there is a new experience... Like the story about the man with the black bag, who went off at each station... Was this man buying stuff in some stations and selling it in another ? Or was he a courier to deliver packages and messages ? We got intrigued by him but never figured out and could not ask. Or the excitement about the tourist that went onto the other platform, and some time later another train came in between our train and that platform, so he crossed the tracks 'just-in-time' in front of this oncoming train... Or the that time some of us were in the station toilet and had to hurry because we heard the train getting in motion (note : this was just a changing of locomotive, a fact we could not guess at that time of course...). There are many other happenings, some of them perhaps even not noteworthy enough to write them down here, but at the time of traveling, I felt they all added up to one big adventure. Of course you can also read books, play cards, drink beer, etc... and some people do, but I have to advise you : do not bring a lot of books. I only managed to read two pages of the book I had brought with me. There was simply not enough time and so much going on. And at the end of the trip, after four days, you say goodbye to some new friends. Russische vertaler-tolk - Heeft u een Russische vertaler, tolk of Russische lessen nodig? Wij lossen uw taalproblemen professioneel op !